Originally Published in The Washington Times on 10/27/14. Desperate times call for desperate measures, and with the possibility of Republicans gaining control of the Senate in the upcoming midterm elections, the left is resorting to jaw-droppingly despicable race-baiting tactics. From the White House to the Georgia Democratic Party, to the gutter from which Al Sharpton spins his hateful rhetoric, the Democrats’ race-baiting machine is in full gear in a furious effort to drive blacks to the polls. Because her husband’s unpopularity makes his presence politically toxic for liberal candidates, first lady Michelle Obama is traveling the country stumping for Democrats. In what is a new low for a first lady, her get-out-the-vote speeches are laced with race-baiting terms. In Pennsylvania, in an effort to urge attendees to vote, Mrs. Obama reminded the crowd that voter turnout was responsible for her husband’s election. To make sure the blacks in the audiences got the racial message, she used the phrases “us versus them,” “folks like us,” and “too many of our people.” Mrs. Obama repeated the same terms in her addresses in Minnesota and Iowa. The Georgia Democratic Party stoked racial fears as well, by exploiting the death of Ferguson, Mo., teen Michael Brown. In a mailer targeting black voters, the party used a picture of a man kneeling in the street with his hands up, surrounded by smoke, flames and police car headlights. This was clearly designed to evoke emotions surrounding the shooting of Brown and the subsequent protests. Finally, Mr. Sharpton, a race-card hustler, is heading to Ferguson for the final days leading up to the election. 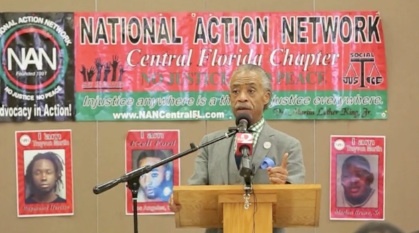 Mr. Sharpton played a high-profile role in Ferguson following Brown’s death. During that period, it was reported he had a direct link to the White House and was, in fact, serving as an adviser to 1600 Pennsylvania Ave. Given the close relationship between President Obama and Mr. Sharpton, as well as the need to drum up black turnout, it’s certainly not a stretch of the imagination to conclude that the White House dispatched Mr. Sharpton to Ferguson with the primary purpose of whipping up emotions and generating national news. The importance of black turnout for the midterm elections was noted in a recent front-page story in The New York Times, based on a memo from Cornell Belcher — a former Obama pollster. Mr. Belcher warned that the “African-American surge voters came out in force in 2008 and 2012, but they are not well positioned to do so again in 2014.” Given this, Mr. Belcher predicted “crushing Democratic losses across the country” if the black voters did not turn out. Clearly, such a dire warning would provide the motivation for Democrats to use the race card in order to prevent an election-night disaster. It remains to be seen whether the race card will bail out Democrats this election, but the days of shameless exploitation are coming to an end. Mr. Obama’s policy failures have been a great disappointment to blacks. With the highest unemployment rate, the lowest average incomes, and a disproportionate financial burden imposed by the president’s misguided energy policies, the black community is experiencing a growing dissatisfaction with politics as usual. As outreach director at FreedomWorks, I’ve had the opportunity to participate in town hall events with the black community in cities, including Chicago. At these events, I’ve heard complaints about Mr. Obama’s failures. However, this disappointment goes well beyond my personal anecdotes. The left’s efforts to drive black voters to the polls for the upcoming midterm elections through outrageous race-baiting tactics are reprehensible. In the end, though, sound policies, not scare tactics, will win the day. Following the exposure of Rachel Dolezal’s lie of being black and not white, many on the left have come to her defense giving her a pass for her deception. Let’s face it, the Clintons are carrying more baggage than a cargo plane and Hillary’s email scandal is only part of the twisted Clinton history. Michelle Obama’s commencement speech at Tuskegee University is causing significant backlash for its racial tone. First Lady Michelle Obama raised racial bias multiple times during her commencement speech at Tuskegee University. FreedomWorks Senior Fellow Rev. C.L. Bryant's great work in conservative activism was featured on KTBS News On Your Side in Shreveport, Louisiana. Watch FreedomWorks Senior Fellow Rev. C.L. Bryant along with Kevin Jackson discuss the violence in Ferguson, Missouri, on NewsmaxTV with host Ed Berliner. Listen to FreedomWorks Senior Fellow Rev. C.L. Bryant discuss the ongoing events in Ferguson, Missouri, on the “The Sean Hannity Show” with host Sean Hannity. This is not a story about policy or legislation. This is a story about journalism, and the all too cozy relationship between 'reporters' and the public officials they're supposed to hold accountable. It's been two weeks since Democrat State Senator Ginny Burdick of Oregon was to have held a town hall to answer questions on the current legislative session. In comments of late, Former Secretary of State Colin Powell, a decorated military veteran with impeccable credentials, has shown a proclivity for adopting an adversarial stance towards the GOP. As one of the most prominent figures in the party over the past two decades through his military service and cabinet positions, Powell has always had a decidedly positive imprint on the reputation of the GOP with his name constantly rising as a possible presidential contender.